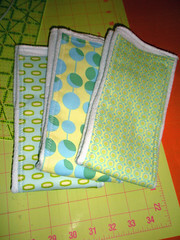 I finished a baby quilt and a few of those little everything cloths, made with a cloth diaper and cute fabric. I’m going to mail of the package tomorrow. 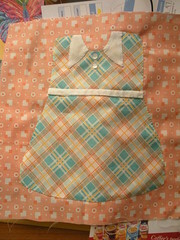 Now I’ve just got to finish my little applique dresses for our sewing group’s quilt. In the middle of doing my first real attempt at free-motion on the baby quilt, my Singer Confidence machine grownd to a halt. I took it right into my guy (after I tried to pry the casing off, with no luck) and he fixed it up. But when I picked it up, he said, “how long has the computer screen been out?” I was like, “what? !” That dumb screen is totally necessary…you need it to know what stitch you’re using, length, width…if you want to sew letters, you have to program them in on the screen. Ugh. Not cool. So my machine is basically worthless unless I want to sew an auto-width and length straight stitch. 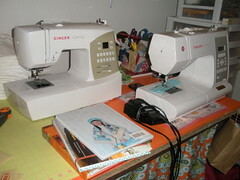 Here I was, all distraught over no more sewing machine, and he hands me a perfectly good one for nothing. He wouldn’t take any money – he said he wouldn’t be able to sell it anyway. So, happy ending! I finished up the baby quilt on the new machine, and it’s great. Here’s a photo. Oh! 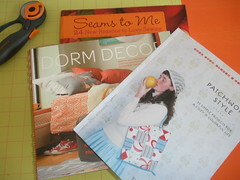 And I got a bunch of awesome new books! Lovely, lovely, lovely. And great deal on the sewing machine. 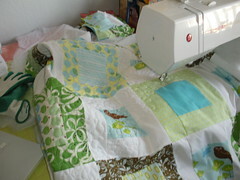 However … why are you sewing baby quilts, inquiring minds would like to know? I’m known there as Knitting Granny. Thanks for your inspiration and specifically your template. I wouldn’t be doing hexagons without it! Thanks for stopping by, Ida! Good luck with your hexagons…share pictures!